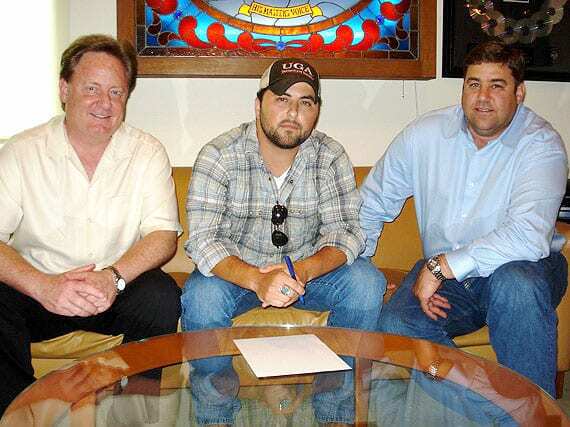 Singer-songwriter Tyler Farr has signed a recording contract with BNA Records. The Missouri native is in the studio working on his debut album. (L-R): Gary Overton (Sony Music Nashville Chairman & CEO), Tyler Farr, and Jim Catino (Sony Nashville VP A&R). Russian billionaire Len Blavatnik agreed to a $3.3 billion purchase of Warner Music Group last week, and now has his eye on EMI according to the New York Post. Citigroup is prepping EMI for sale after repossessing it from Guy Hands’ Terra Firma in February. The auction was expected to launch in May, following the Warner auction. Grand and Gee Music Publishing has signed on with Chip Voorhis’ Voorhis Consulting for business management and bookkeeping services. Voorhis Consulting is an independent firm specializing in financial services for music publishers, songwriters, engineers and studios. Grand and Gee is enjoying the success of the current Chris Young hit “Tomorrow.” Voorhis may be reached at 615-977-4727 or chip@voorhisconsulting.com. Due to the popularity of the CMA Songwriters Series, the engagement will return to Joe’s Pub in New York for a two night run, June 21-22 with two shows per night. Easton Corbin will be the featured artist/songwriter on June 21 and Clay Walker will be featured on June 22. Performing both nights will be Carson Chamberlain, Mark D. Sanders, and host Bob DiPiero. Details here. The Naxos Group is proud to announce that American military music label Altissimo! Recordings has joined their roster. The Naxos Group has purchased Altissimo! and Naxos of America will begin physical distribution of the label in North America on June 1, 2011. The Country Network (TCN), a country music video television network located on Music Row in Nashville, TN, is now broadcasting on Newport Television stations in Salt Lake City, Tulsa, Fresno, Wichita, and Little Rock. The Academy of Country Music has been named the winner of the prestigious 2011 Maggie Award for “Best Annuals & Custom Publication/Trade & Consumer” by the Western Publishing Association, an honor bestowed specifically for the 45th Annual Academy of Country Music Awards program book.